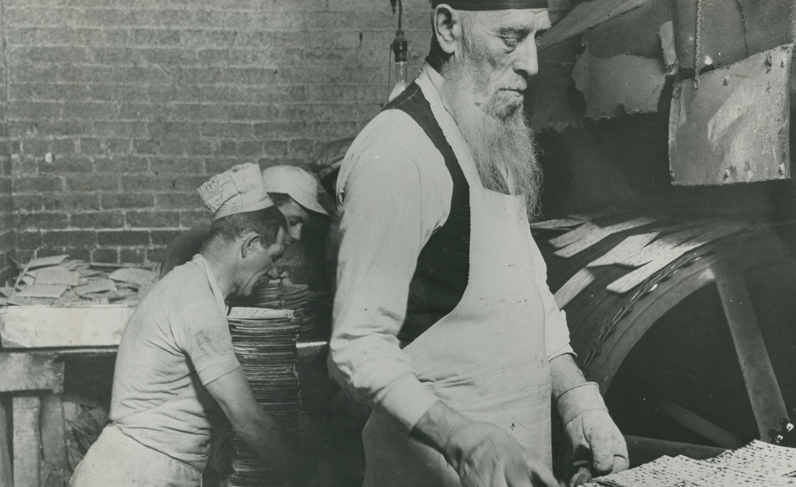 Jacob Radbord baking matzah, 1934. Gloria Elbling-Gottlieb Photograph, Rauh Jewish History Program & Archives, Heinz History Center. The Rauh Jewish History Program & Archives was founded in 1989 to collect, preserve, and make accessible the documentary history of Jews and Jewish communities of Western Pennsylvania. The program is supported by Rauh Jewish History Program & Archives Endowment Fund of the Foundation of the Jewish Federation of Greater Pittsburgh, the Senator John Heinz History Center, and many generous donors. The collections of the Rauh Jewish History Program & Archives document the lives of individuals and families and the histories of congregations, organizations, institutions, and businesses. Correspondence, diaries, memoirs, ledgers, minutes, scrapbooks, ephemera, audio tapes, photographs, and moving images are housed in archival containers and stored in a monitored, secure, and climate-controlled environment. Related artifacts are transferred to the History Center’s museum collections. The collections are available for research in the reading room of the Detre Library & Archives of the History Center. For more information, please email rjarchives@heinzhistorycenter.org. From 1989 until 1999, the Archives was supported by the United Jewish Federation (currently the Jewish Federation of Greater Pittsburgh), in-kind contributions of the Senator John Heinz History Center, and donors. In 1999, Richard E. Rauh created an endowment at the United Jewish Federation Foundation, and the Western Pennsylvania Jewish Archives was renamed the Rauh Jewish Archives (RJA). In 2004, through an agreement between the Jewish Federation Foundation, the RJA Advisory Committee, and the History Center, the RJA has become a program of the History Center, with the income from the RJA Endowment at the Jewish Federation Foundation has been directed to the History Center to support the work of the RJA. Be the first to receive the Rauh Jewish History Program & Archives’ new quarterly e-newsletter! Sign up to learn about upcoming events and to see highlights from the RJA’s collections.